In a coordinated effort to accommodate the ever-increasing demand for the transportation of goods while also reducing its impact on society, Volvo Group collaborated closely with several key California stakeholders to demonstrate Eco-Drive technology as part of its involvement in the Zero Emission Drayage Truck Demonstration Project. The project, led by the South Coast Air Quality Management District, is funded by the California Climate Investments program to reduce key criteria pollutants, greenhouse gases (GHGs) and petroleum usage. The vision of a connected vehicle infrastructure test bed for Eco-Drive brought together two independent projects funded by the California Air Resources Board and the California Energy Commission. This resulted in an unprecedented partnership between a number of public agencies, including the Port of Los Angeles, Los Angeles County Metropolitan Transportation Authority, the Gateway Cities Council of Governments, Los Angeles County Department of Public Works, and private companies. More than 80 people, including local elected officials and community representatives, attended the Eco-Drive demonstration event hosted by the city of Carson, and rode along the “connected” corridors on the Volvo VNL truck, witnessing firsthand the Eco-Drive application in real-world environments. The event marks the beginning of a 12-month technology assessment and design refinement period for two distinct Eco-Drive concepts: an integrated visual advisory developed jointly by University of California Riverside Center for Environmental Research and Technology (UCR-CERT) and the Volvo Group, and a smartphone-based audible feedback developed by UCR-CERT. 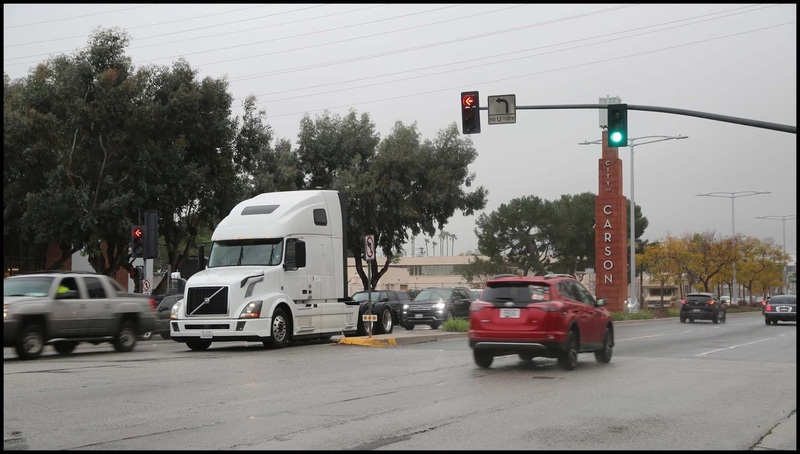 Both Eco-Drive concepts will be evaluated on arterials near the San Pedro Bay ports in Southern California, and aim to reduce emissions and energy use to improve the health and quality of life in communities disproportionately affected by heavy truck traffic.